The Big Island is the largest and most volcanically active of all Hawaiian islands. The island still grows every day because of its #1 tourist attraction (which also happens to be one of the most active volcanoes in the world): the Kilauea volcano. Our island is know for its beautiful nature and many cool activities and it is almost impossible to fit everything in your vacation – even if you stay more than a month! That is why we give you our personal highlights for the Big Island: as an efficient way to get to know our favorites of Hawaii. Favorite local activities for Kona, Hilo, Volcano Village and Waimea. The Big Island is officially known as the island of Hawai’i and received this nickname for a good reason: it is the largest island of the United States with a total surface of 4,029 square miles (10,433 square kilometers)! Its surface area is also greater than that of all other Hawaiian island combined. The 200,381 inhabitants of the Big Island (which is only 14% of the total population of the state of Hawaii, 2017 census) mostly live in and around the two large population centers in the island: Hilo (the capital) on the east coast, and Kona on the west coast. Despite these impressive figures the state of Hawai’i actually is pretty small: there are only 3 states (Connecticut, Delaware, and Rhode Island ) with less land surface than the aloha state. Yet, our “small” Big Island is home to 8 / 13 of the climate zones in the world, and there are many fun, exciting and accessible activities possible for you to explore it. The following video is a great introduction to many of our favorite spots, and includes footage of: Waipi’o valley, Akaka falls, Rainbow falls, the Kona coast, Mauna Kea, Pololu valley, dolphins, a manta ray, and much more. Video credits go to Tyler Fairbank from Light Owl Productions. If you are interested in reading more about Hawai’i we recommend the following two pages: One with 3 reasons why we think the Big Island is so incredible impressive, and the other with 40+ facts about Hawai’i. 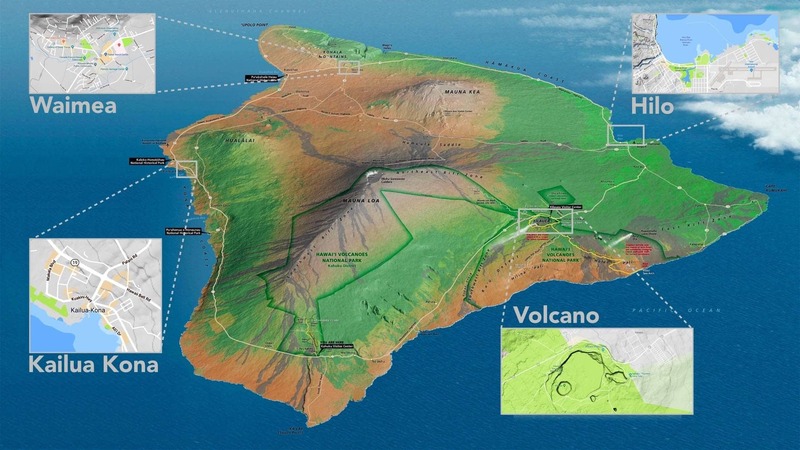 The Big Island is home to the tallest sea mountain and the largest volcano in the world, and has 8/13 climate zones! These are our Favorite Hawaiian Records. 40+ Big Island Facts and Trivia. Learn fun stuff! "Did you know" fact sheet for the Big Island. Collection of interesting facts, fun trivia and little-known gems of knowledge about Hawaii. Surprise yourself. Continue reading about: 40+ Big Island Facts and Trivia. Learn fun stuff! If you like beaches you are in luck. The Big Island is a true paradise, and has quite some amazing white, black, and green sand beaches! Do you want to know where black and green sand come from? Easy: lava and crystals! Read more about why the sand is white/green/black on these favorite Big Island beaches. How to visit the Mauna Kea summit on the Big Island of Hawaii. Free stargazing @ the visitor center, see the Sunset, Safety Tips, and MaunaKea Summit Tours. Manta ray dive and night snorkel tours take you to see the mantas up close. This Kona excursion is our #1 FAVORITE thing to do on the Big Island!. We share our favorite Hawaiian snorkeling spots and safety tips. Learn where should you rent or buy gear, how to best find the fish, and what tours to book. Definitive guide for safely seeing lava (DIY or with a tour) on the Big Island. Lava hikes, Lava boat tours, lava helicopter flights + public viewing areas..
You can also find an overview of all activities on the Big Island on our website. These guides are styled in a DIY fashion and explain how you can best plan everything you want to do, yourself. If you are more interested in other people doing the planning you should definitely have a look at our new curated tour section, where we list a small amount of tours that we know and love, that receive consistent high praise and good reviews, and that give back to the community and try to minimize their impact on the environment. Many people tend to forget about the culinary side of their vacation, which is a real shame! The Big Island is one destination where you should do anything to avoid that trap because food here can be so different from what you can find on the mainland. It is easy (and tasty!) to find local food in restaurants, farmers markets, supermarkets or, at the source, the farm/orchard. Malasadas (Portuguese sugared fried dough snacks) are a tasty snack for when you are on the road. The combination of Kalua pig with one of the many locally produced micro brews never gets old, and don’t leave the Big Island without a taste of one of the world’s most famous coffees: Kona coffee. List + map of farmers markets on the Big Island of Hawaii. Find directions + opening times for local markets near Hilo, Kona, Volcano village and Waimea. Guide for organizing a DIY Kona Coffee Tour on the Big Island of Hawaii. Learn how to visit, where the best farm tours are, what the best time is for a tour. Hawaiian food is a mix from traditional local food and exotic dishes and crops introduced by immigrants. Learn about the many local snacks and specialties. Hawaiians love good beer, and know how to make it. Read about the three very good local breweries on the Big Island of Hawaii (as well as a beer festival).. These are our “local flavor” unmissable activities for each of the four largest cities on the Big Island: Hilo, Kailua Kona, Volcano Village and Waimea. The Puakō petroglyph close to Kailua Kona on the Big Island of Hawaii has about 1,200 petroglyphs visible in the park to which access is allowed. Directions. If you are sending more time in Kona you can try out some of our 5 favorite things to do in Kona. Waimea at 2500 ft elevation gives you a taste of the Hawaiian highlands. The motto of the Big Island Brewhaus in Waimea is Live Beer, Live Food, & Live Music. This brewpub also offers fresh mexican food and an outdoor beergarden. Read more about our favorite things to do in Waimea. If there is only one thing you can do in Volcano Village the choice is simple. The Hawaii Volcanoes national park is for us without question the only “must visit” attraction on the Big Island! The Kilauea volcano is THE most popular attraction on the Big Island. Visit past and present eruption sites and see how lava impacts impressive landscapes. If have have more time to spend in our favorite town on the Big Island you should have a look at our list of things to do in Volcano Village. A visit to Hilo isn’t complete without a stop at the Hilo farmers market for souvenirs and tasty food. Pick up some lunch for on the road, when you are taking one of the incredibly scenic drives close by. The Hilo Farmers Market with 200+ local farmers and crafters is a must-visit when you are in Hilo. (+5 nearby farmers markets in Hilo, Pahoa, and Keaau). Hilo is a great city to use as base for a few days. If you spend more time in the area you should have a look at more of our Hilo favorites.